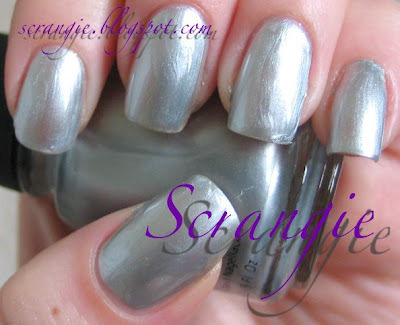 Scrangie: Silver Swatches, Part 1. In response to a request from lovely reader (and blogger!) Tabe-chan, here are some silvers. In case you can't tell, I ADORE silver. 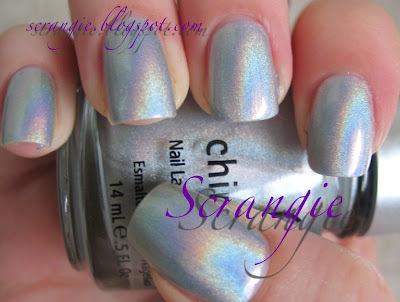 China Glaze Chroma-Toes. Chrome finish. CND (Creative Nail Design) Disco Ball. 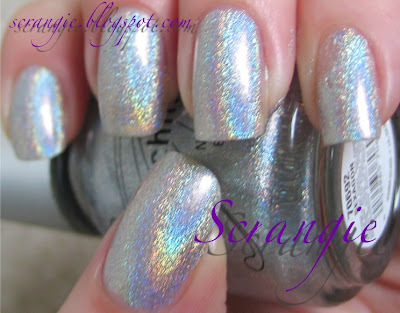 Has lots of holographic glitter circles, extremely gorgeous but hard to capture in a picture. Aw, thanks TK! And you're welcome! SH Sterling should be easy to find, Piggy Polish Sunshine on Snowflakes is seasonal, but I found it pretty recently in the clearance bin at Ulta! OMG! Sunshine on sunflakes is absolutely gorgeous! Emelie, I think it's one of the prettiest polishes ever made! I need to find more of them! I didn't know sexagon was THAT pretty! 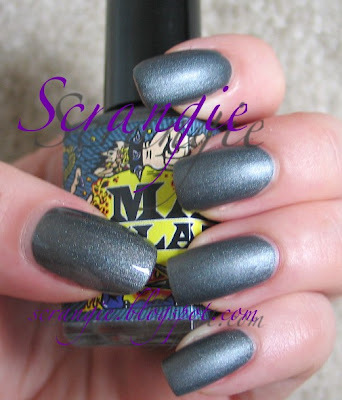 Which of CND Silver Anniversary, Color Club What A Drag, Misa Got To Be Reel and Zoya Trixie has the best staying power? Hahaha, thanks! :D More to come! Wow, I love silver too. One of the only 3 colours I really wear. There are some wicked ones that I am going to have to go track down now. Nat, yay, another silver fan! Gorgeous! 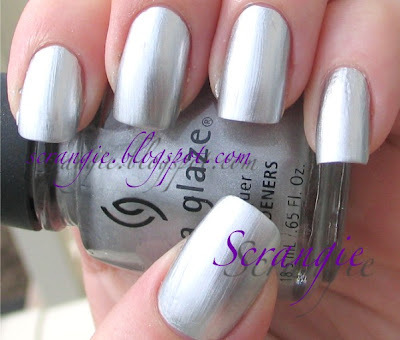 I love silver (and gold) polishes and these swatches are extremely useful in helping me decide which ones to get. Thanks! Shryh, you are very welcome and I am *always* happy to help! Scrangie, I love your blog and I love this post! I can't believe this is only part 1, though - geez, you really do love silver, huh? ;) Me, too, and you've created more lemmings for me. Oh my Gooood! I adore silver and it looks great on you! I have been eyeing CC What a Drag for so long! Thanks for posting, you're seriously awesome! Jen, wow, thank you! I really can't resist anything silver! Rocketqueen, thank you :D CC What A Drag is really nice, and inexpensive, too! 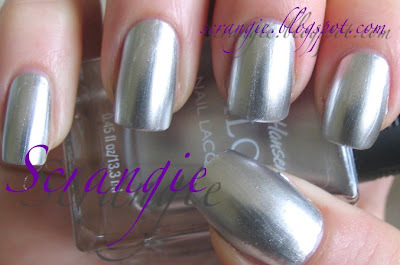 I adore silver aswell! Now I need two more laquers that I need to get. ;) Lovely pictures as always! Absolutely lovely! Just found your blog via nailgal.com. I'm currently wearing China Glaze OMG. How great is it?? Luv it. And dries sooo quick! Ultimate paint-and-hit-the-town. Great blog, will be checking back a lot! 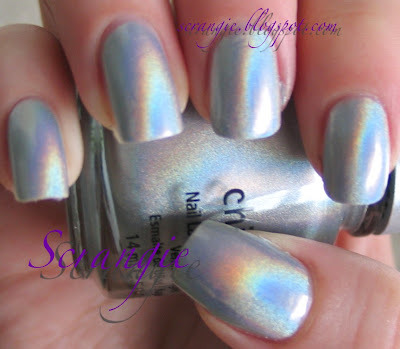 I love that about OMG (and all of China Glaze's other holographic polishes). They dry so fast and look amazing!